A Palestinian was killed in an Israeli air raid in the Gaza Strip after Israel said one of its aircraft targeted a group launching balloons carrying firebombs. Three other people were wounded on Thursday in the attack east of Rafah in the southern Gaza Strip, the health ministry said. A family member said the Palestinian killed was working as a border policeman in the Hamas-run enclave. Reporting from Gaza, Al Jazeera’s Charles Stratford said a 22 year-old-man, apparently a member of the Qassam Brigades, the armed wing of Hamas, was killed. Israel has pledged a tougher response to Palestinians who have for months sent balloons and kites carrying firebombs over the border fence to burn Israeli farmland. Israel’s fire service says hundreds of fires have burned about 3,000 hectares, causing damage amounting to hundreds of thousands of dollars. Palestinian protesters involved in the petrol-bomb attacks have told Al Jazeera they will continue sending balloons and kites until Israel lifts its 12-year-old blockade on Gaza. Following Thursday’s attack, Israel’s army said Palestinians launched mortar rounds at soldiers near the border fence, causing no injuries. “Certain Israeli politicians are putting a lot of pressure on the government and military for a heavy response,” said Stratford. The military has opened fire at those launching the incendiary devices in recent days, but Thursday marked the first time someone was killed. 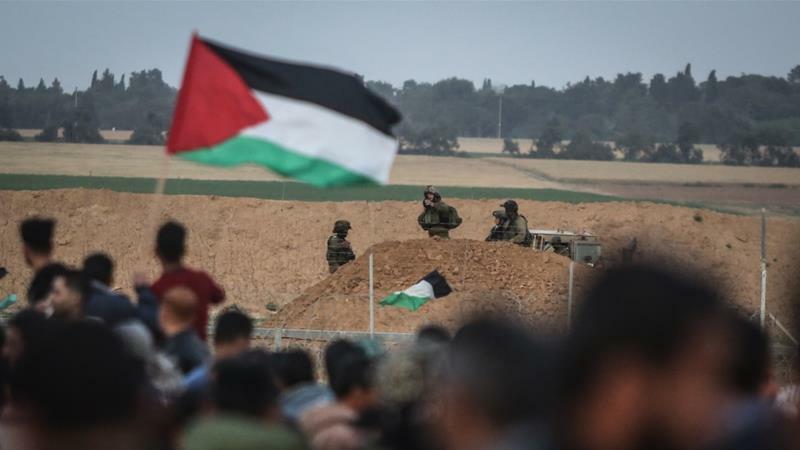 More Palestinian protests are expected to continue in the Gaza Strip on Friday for the 17th week since they began March. Last weekend saw the most severe exchange of fire between Israel and Palestinians in Gaza since the 2014 war. Israel hit dozens of sites in the Gaza Strip in Saturday’s air strikes, killing two Palestinian teenagers. The same day, about 200 rockets and mortars were fired at Israel from Gaza. Four Israelis were wounded when a rocket hit a house in the nearby city of Sderot. More than 130 Palestinians have been killed by Israeli forces during the months-long demonstrations dubbed The Great March of Return. Israel says Hamas has been orchestrating the protests to provide cover for cross-border attacks. Hamas denies this. Gaza protests: Will Israel stop using deadly force? Fresh rallies planned as Israel weighs al-Aqsa security.